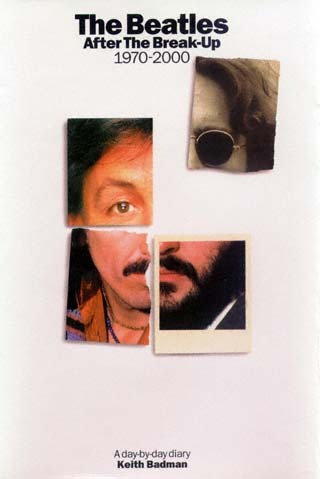 The Beatles After The Break-Up 1970-2000 is the first book ever to catalogue just about everything that John, Paul, George and Ringo did after the group disbanded ... everyrecord, every concert, every TV and radio appearance, every interview ... and much more besides. Every Beatle related event is covered, whether it be as awesome as the tragic death of John, or as predictable as the staggering prices reached in yet another auction of memorabilia. Author Keith Badman has listed every known encounter between John, Paul, George and Ringo, for whatever reason, whenever and wherever it took place. Included are details of meetings both important and trivial, in the studio, on stage and in their lawyers' chambers. Here are extracts from key interviews which explain the ebbs and flows of the complex relationships between the four, and later three, surviving Beatles. Here is the ongoing saga of popular music's most enduring 20th Century romance... a comprehensive history of the greatest pop group of them all. Keith Badman is a regular contributor to The Beatles Book magazine and Record Collector. He was a consultant on the documentary television series The Beatles Anthology and has presented video shows at Beatles conventions throughout Europe. Regarded as a world authority on film footage of The Beatles and pop in general, Keith has spent years searching the globe for film of The Beatles, both as a group and as individuals. He was consultant on all three series of the Channel 4 pop profile series My Generation, the BBC music history series Dancing In The Street, and many other TV rock documentaries. Keith Badman is the co-author of Good Times Bad Times, a definitive diary of The Rolling Stones during the Sixties; Quite Naturally, a biography of The Small Faces; and Empire Made: A Guide To Everything Mod. "Until now, The Beatles story has been simply incomplete"
From 1970 onwards the disbanded Beatles were at last free to follow their individual interests. From that point on there were four separate stories... but they were stories that would form a complex overlapping history of quarrels and reconciliations, personal projects and sporadic collaborations. For the first time ever, a noted Beatles expert has meticulously documented the entire period of The Beatles after the break-up. Keith Badman has produced a dazzling and astonishingly detailed day-by-day chronicle of what each of the ex-Beatles did from April 1970 onwards. It's all here, day by day. All the ... concerts ... solo releases ... known meetings between ex-Beatles ... film, TV and radio appearances ...business deals, legal battles and personal feuds ... Beatles-related births, marriages and deaths. Starkly punctuated by the murder of John Lennon, here is the as-it-happened story of four individuals emerging from the straitjacket of pop music's greatest ever success story. And for the first time ever their solo careers are shown to be every bit as fascinating as their legendary decade together. With an introduction by Miles, author of The Beatles: A Diary and Many Years From Now, the authorised biography of Paul McCartney. Fully illustrated with scores of pictures documenting John, Paul, George and Ringo... after the break-up. Webmaster's Comments: This book is very valuable, and unbelievably detailed. It's a day-by-day diary, detailing every aspect of Solo Beatle life. In regard to that, notes on the recording sessions themselves or releases in countries other than the UK or USA are very limited. I've noted omissions and errors (wrong dates, wrong song titles, missing facts like the numerous radio interviews Paul gave in the U.S. during the Flaming Pie promotion). Dates from late 1999 and 2000 are speculative only. Then, this book does not come with an index which makes it hard to find something if you don't know the date. This is very disappointing. Nevertheless, this book gives very much insight into the solo years. For details on released and unreleased recordings, and the sessions themselves, you must get Eight Arms To Hold You, which I recommend getting first, anyway! "If you need to know every activity each Beatle has participated in from the minute Paul announced he was leaving the group, until the present time, this is the book for you. It's a diary, plain and simple, which lists day by day appearances, meetings, concerts, interviews, record releases, etc., many of which were obscure until now. If you're looking for narrative prose about the solo Beatles, look elsewhere. This book definitely has the most detailed account of John's final day, and the other Beatles' reactions. It has a few rare photos; a must have for true Beatlemaniacs." PLEASE use the above links if you want to order this book. (you can always cancel it before you place the order, anyway). Thank you very much! This site will then earn a commission.